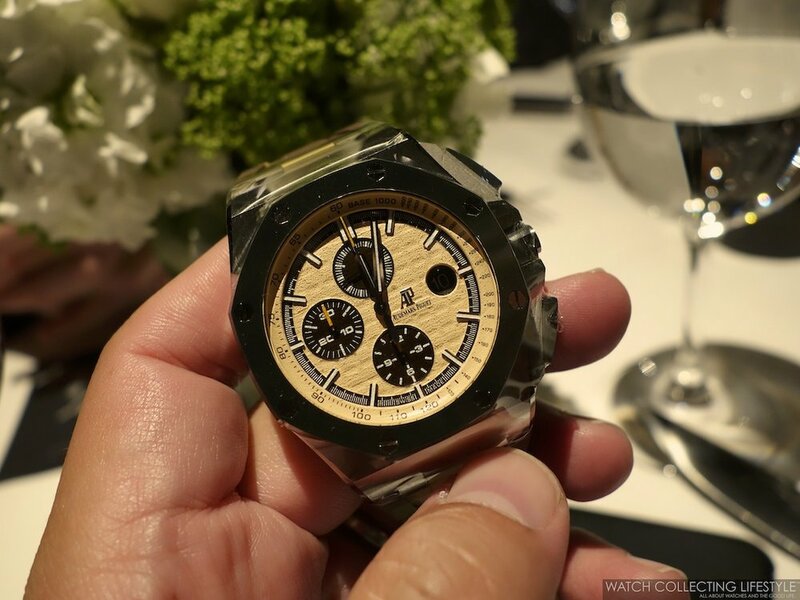 Experience: Audemars Piguet Private Dinner with Watch Collecting Lifestyle. Where Gold AP Watches Were the Common Denominator. Yesterday November 13, 2018, we had the honor of hosting a private dinner with our friends from Audemars Piguet at one of Dallas’ best steakhouses. 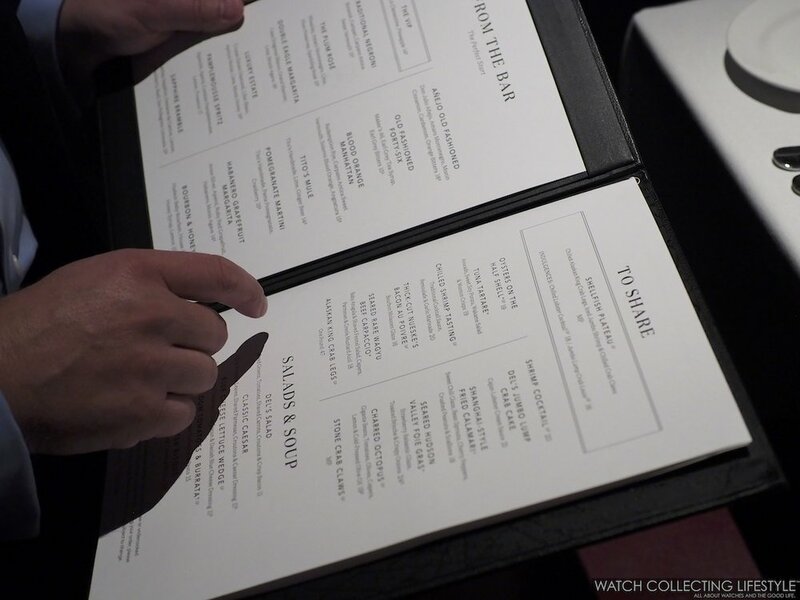 With Del Frisco’s Double Eagle Steak House as our meeting point, the common denominator for the night, were the so many gold APs on the wrists of our watch collecting friends. From the massive 334-gram Royal Oak Offshore Chrono in 18K rose gold with ruthenium dial ref. 26470OR on our wrist, to the vintage-inspired champagne color dial Royal Oak Extra-Thin Jumbo in 18K yellow gold ref. 15202BA on the wrist of one of our friends, to the ultra-rare and exclusive 200-piece limited edition Royal Oak Frosted Gold in 18K white gold with a stunning 'grande tapisserie' blue dial ref. 15410BC, these were not the only gold AP watches on the wrists of our guests. Once settled in at Del Frisco’s, the usual Negronis filled the table with one of the largest trays we’ve seen of Negronis delivered at the same time at any restaurant. And just like the Negronis started to flow, the same happened with the watches coming off of the wrists of our guests as they were taking wristshots and sharing their special pieces with everyone in the group. Despite the common denominator this evening were the gold watches, this could’ve swang in a completely different direction had we brought with us the legendary and very first Royal Oak Offshore Chronograph ‘The Beast’ ref. 25721ST. 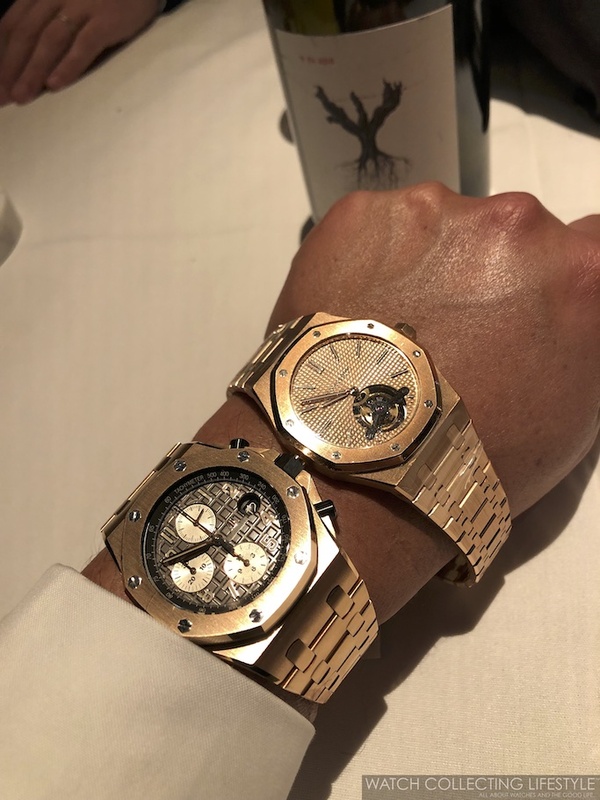 And just as Emmanuel Gueit’s —the designer of the Royal Oak Offshore— watch surfaced and sold this past weekend at the Phillips Watch Auction EIGHT in Geneva, three Royal Oak Offshores ‘The Beast’ showed up at our dinner with Audemars Piguet last night. While two of them were early D-series examples within the first 200 pieces ever made and one was an early E-series, only one of the D-series is fitted with the rare and highly coveted blade-type clasp. Without a doubt, this was already pointing to be a memorable evening and the beginning of an unforgettable time with watch collectors alike. As the starters made their way to our table, the Negronis were promptly swapped for heavy pour glasses of Marques de Murrieta Gran Reserva —one of our favorite Rioja wines. Once our guests were served the thick-cut Nueske’s bacon au poivre with Bourbon molasses glaze —a must-have at Del Frisco’s—, fond memories of NYC’s Benjamin Steakhouse and their signature thick-cut bacon came to mind. Then, to continue to amuse our palates, tuna tartare, chilled jumbo shrimp and a carpaccio —almost as good as the one at the Salon International de la Haute Horlogerie— followed. But let’s not forget the perfectly cooked entrées we got to enjoy including their staple 45-day dry aged steaks and the signature Double Eagle Porterhouse that Del Frisco’s is well know for. But regardless of the decadent food, the amazing wines and the great company we had with us, the real reason to be there, were the watches. It was finally time to explore some of APs novelties and the very special watches they had brought for the occasion, but also the watches that our guests were wearing. Who doesn’t love a double watch wristshot right? Particularly when you have the amazing Royal Oak Perpetual Calendar in 18K rose gold ref. 26574OR right there next to you. A nice selection that included the recently released Royal Oak Offshore ‘Combat’ ref. 2640SO, the Royal Oak Offshore Havana Brown and even the Royal Oak Tourbillon Extra-Thin Westime Special Edition ref. 26515OR, we were all literally in watch heaven. As the watches made their rounds around the table and with plenty of time for everyone to play with them and take as many pictures as they wanted, a bottle of Hakushu 12 —one of our favorite Japanese whiskys— made its appearance. Properly guarded by our friend’s Royal Oak Frosted Gold in 18K white gold, the Hakushu 12 was the last thing to hit our palates for the night and to wrap up an amazing private dinner in partnership with our friends from Audemars Piguet. Nevertheless, the night could’ve not ended without properly capturing a remembrance collective wristshot. Not an easy feat but we think we did quite well with all our guests and friends from Audemars Piguet. And just as this evening began with the roaring engines of the Lamborghinis and Porsches approaching the restaurant, almost four hours later it was finally time to say goodbye to everyone with the same roaring engines —especially the one from the Lamborghini Huracán Performante Giallo from one of our friends— that were now killing the silence of the night upon our departure. As usual, a delightful evening and yet another night to remember in our watchlife. We hope that our images made you feel like you were there with us. 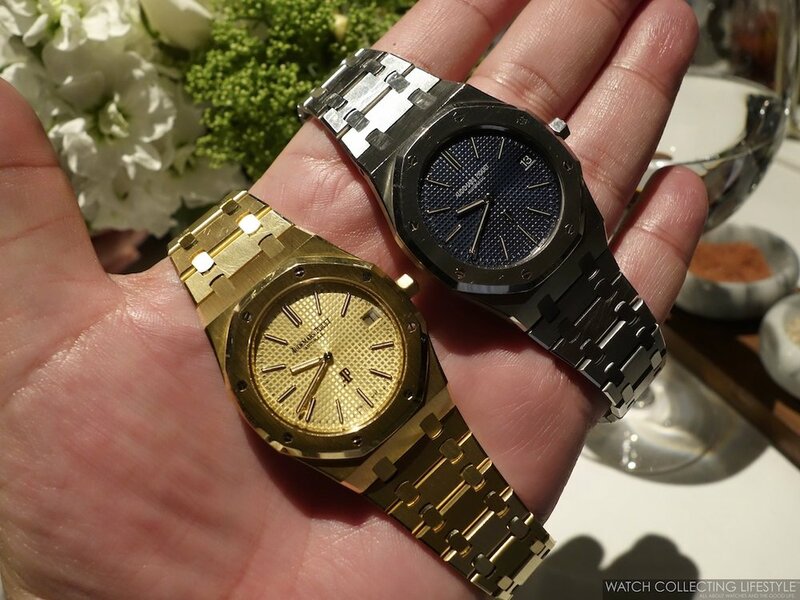 Thank you Audemars Piguet for entrusting and partnering with Watch Collecting Lifestyle on this private dinner. For more info on Audemars Piguet click here. 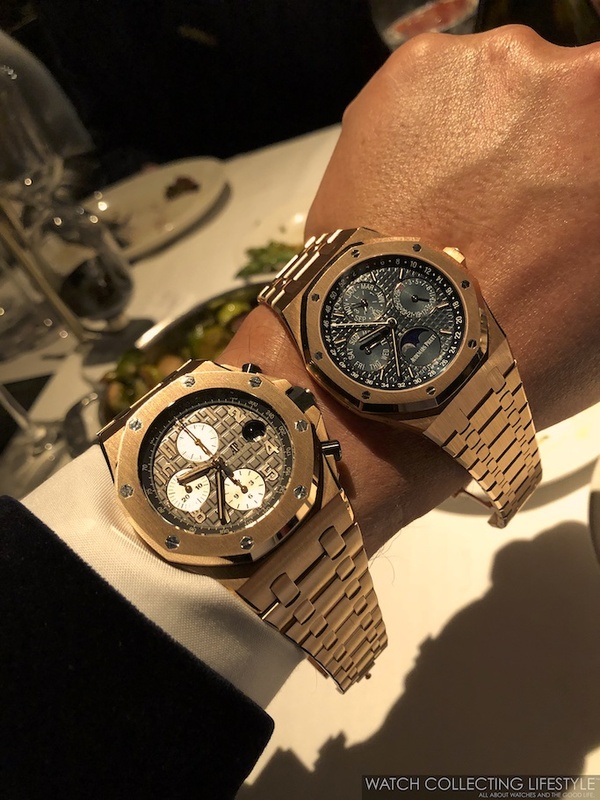 Posted on November 14, 2018 by Editor & Publisher and filed under Audemars Piguet, Events and tagged Royal Oak Offshore Chronograph ref. 25721ST Royal Oak Extra-Thin Yellow Gold ref. 15202BA Events Del Frisco's Royal Oak Frosted Gold 41 mm Royal Oak Frosted Gold ref. 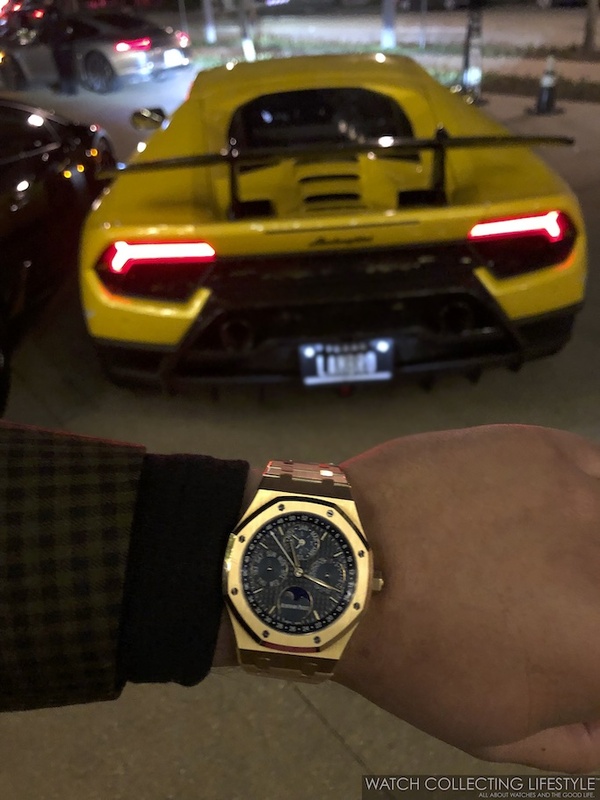 15410BC 2018 Audemars Piguet Royal Oak Offshore Chronograph 'The Brick' Royal Oak Offshore The Beast Wine Audemars Piguet Food Audemars Piguet Private Dinner with Watch Collecting Lifestyle WCL Events Mainstream Brands Most Popular.